Martin Sharp is one of Australia’s foremost pop artists as well as a cartoonist and songwriter. His psychedelic posters of Dylan and Hendrix are classics of the genre, while his posters for the Nimrod Theatre Company are also iconic in theatre circles. He also designed record covers for the rock band Cream. From 1963 to 1965 he was art director of Oz magazine. In 1970 he founded the Yellow House near Kings Cross, inspired by Van Gogh’s house in Arles, which he converted into a 24-hour performance art space. During the 1970s, he was a champion of Tiny Tim and of Sydney’s Luna Park. Garry Shead has known Sharp for 50 years, first meeting at the National Art School in East Sydney. Sharp appeared in three of Shead’s experimental films, the DVD of which was released in 2011. They also published the Arty Wild Oat newspaper, which was the inspiration for Oz magazine. Born in Sydney in 1942, Shead studied at the National Art School. A painter, printmaker and filmmaker, he has had over 50 solo exhibitions. His DH Lawrence , Royal suite and Ern Malley series are all concerned with Australian identity. 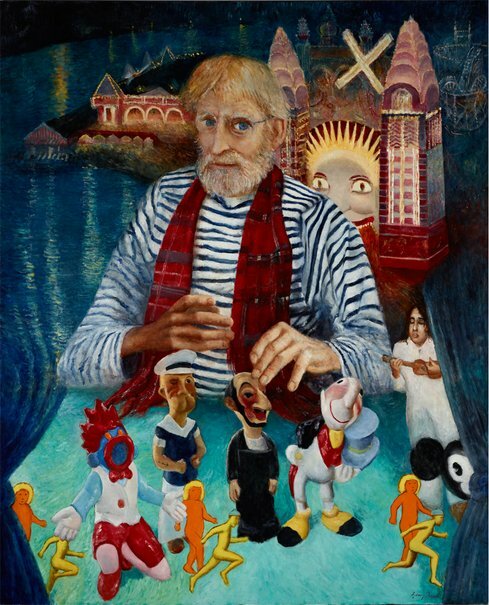 He won the 1993 Archibald Prize with a portrait of publisher Tom Thompson and the 2004 Dobell Prize for drawing. This is his 14th time in the Archibald.